There is nothing like the twin bond. Watching my girls giggle and cuddle together is the sweetest thing I’ve EVER seen. They give each other rubs and hugs when they’re hurt. They will call throughout the house “C’mon Josie! Let’s go play!” They feed off of each other’s emotions and this can be a good and bad thing. When they’re happy, their joy is contagious. When they’re mad? 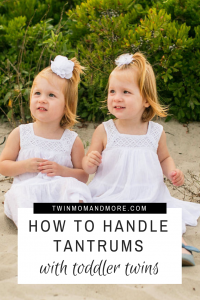 They’re both mad and the tantrums are epic. 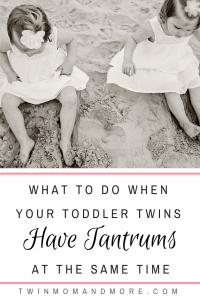 While there is no quick fix or one solution to help your twins not lose their marbles, I do have a few tips to help you get through tantrums with toddler twins. Ugh, I LOVE the age of two. It’s really not terrible. It’s such a sweet age. Two-year-olds are learning and absorbing everything around them. It’s truly incredible. However, with everything they are learning comes a desire for independence. They want to do everything themselves. Also, they want WHAT they want, WHEN they want it, and it has to be just so. The fact that their communication skills are still somewhat lacking, combined with the fact that they haven’t yet learned how to manage their emotions well can equate to some pretty epic fits. It can be over the smallest things. We have a certain toy pup named Chase (where my Paw Patrol fans at?) and his leg is bent. It’s supposed to be that way, but we have another Chase who’s leg isn’t bent. My girls will come to me and ask me to “fix” Chase’s leg. I try explaining to them that it’s not broken but they still want me to fix it. We have had many meltdowns over this silly leg. It’s frustrating for all of us. Not all two-year-olds go through this phase. Our son was a dream at two (three, on the other hand….yikes). So please know that it is normal for your two-year-olds to be throwing massive fits over the silliest things. It’s developmentally appropriate and it’s not silly to them. And if your friend is telling you that their child never behaved that way at two, pay them no attention. 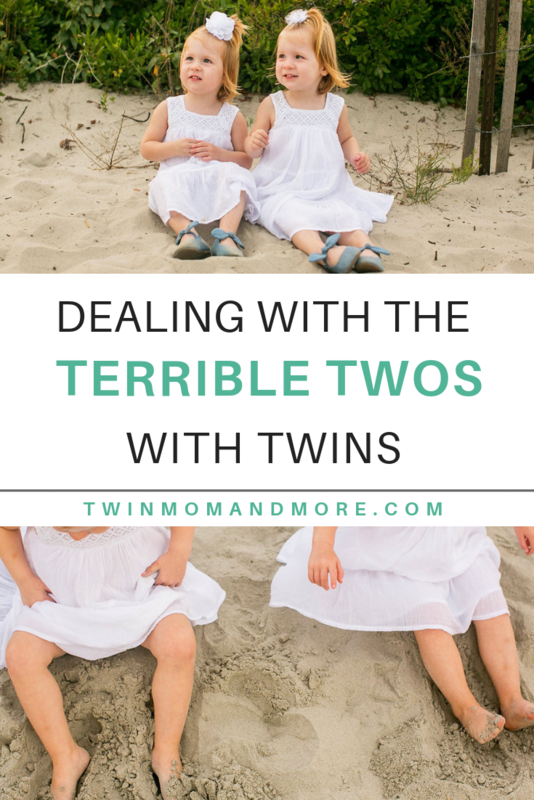 I’m telling you that my toddler twins can be little terrors, so solidarity. The logical adult in me tries to calmly explain to my girls that Chase’s leg is SUPPOSED to be bent. I think if I could just get them to understand that it’s not really broken, that they will stop freaking out. But they won’t. They’re not adults so they aren’t logical the way that I am. Reasoning with your two-year-old will you get you nowhere. OK, listen. 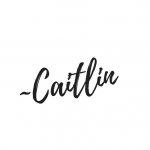 When I say “pick your battles” I do not mean to give your child a direction and then when they don’t comply immediately think, “I’m not going to pick this battle today” in order to avoid a fit. You have to pick your battle before you give the instruction. If I ask my children to clean up before nap and they start to whine and fuss, too bad. I must follow through, otherwise, they are learning that the whining works. I am showing them that they don’t have to listen to me. If I’m tired, they’re tired, and I have the inclination that cleaning up will just lead to a meltdown, I won’t even ask them to clean up. You have to pick your battle before it becomes a battle. Margo will frequently get really mad when we are on our way to get Theo from preschool. She’s getting tired and hungry and just doesn’t feel like it. When I unbuckle her from her car seat she gets mad because she wants to do it herself… even though she literally can’t. If she is in this mood, I know there’s nothing I can do. I just drag her out of the car and carry her surfboard style, crying into the school to get Theo. I empathize with her. “You’re mad that you can’t do it yourself. I think you’re also tired and hungry. It’s OK to be mad” I then tell her one time “It’s not a choice to throw a fit like this. You can be mad but you can’t kick and scream.” Then I don’t say another word and carry her flailing and screaming under my arm. I give her no attention for her tantrum. On a good day, she will start screaming “DOWN! DOWN!” I then will ask her if she’s ready to stop throwing a fit and get down and she nods yes. She then has to apologize and she can get down and walk with her sister. On a bad day, she screams for the entire time. The kids are allowed to watch a little bit of T.V. to help Theo unwind when we get home from school while I make lunch. If Margo is still going at it when we get back in the car, I tell her that she will lose the privilege to watch T.V. when we get home if she can’t calm down. Sometimes even adults just need a good cry. It releases all of the pent-up energy and emotions. I think sometimes two-year-olds just need to cry and they shouldn’t be disciplined for crying. Kicking and screaming, yes, crying, no. I could tell Margo that if she starts throwing a fit she immediately loses her T.V. privileges for the day. However, I think it’s a good thing for her to throw a fit so I can help her work through feeling her feelings and learn how to calm down. I don’t think there’s anything wrong with her crying because she’s mad that she doesn’t have the skills to unbuckle her car seat, as long as she can then calm down. This is important to remember. If an adult is sad and starts crying, we wouldn’t tell them to stop. We wouldn’t put them into ‘timeout’ or remove a privilege. If your child is genuinely crying because they are processing an emotion, it should be handled differently than if they are throwing a fit because they didn’t get what they want. But how can you tell the difference? As the parent, it’s up to you to figure it out. Use your mama instincts. I wish there was truly a quick fix for this, but there isn’t. Here’s what we do with our girls that usually works fairly quickly, although it’s by no means perfect. This is a brilliant thing that my husband came up with. Frequently our girls will both be screaming and hollering at the same time. They are so loud that they hear nothing that’s being said. We end up raising our voices and yelling, just so they can hear us! It feels so wrong to yell because your children are yelling, right? You can read about how we quickly get our children to be quiet and listen <– in this post. Once they are quiet enough that I can talk without yelling, I will offer hugs, drinks of water, or reading books to help them calm down. I remind them that it’s OK to be mad, but not OK to throw a fit. Most importantly, I tell them that if they need to keep crying they are going to their cribs. Sometimes, they just need to cry. That’s fine. But it’s not OK to lie in the middle of the kitchen floor and do it. If my children want to continue to cry, they can do it in their beds. This is if I have already offered to help them calm down and they have declined my offer. My girls will calm down much faster if I put them in their cribs than if I try to hug them or read to them. Theo was the opposite. He tantrumed harder if he was in his crib, so we had to hold him when he was emotional crying. He loved reading the Calm Down book and it worked really well to help him calm down. My girls just throw the book if we try to read it to them. When my toddler twins tantrum in public, I pick one up under each arm, and leave wherever we are. There was one time when my girls were both about to meltdown, at the same time, in a public place that I couldn’t leave immediately. We had left the doctors office, and Theo had been diagnosed with hand foot mouth disease. I needed to stop at the grocery store to get chicken for dinner, and I had promised Theo we could get popsicles because his mouth was hurting. Because of the timing of the doctor’s appointment, it was about 1:30… past naptime, and nobody had had lunch other than snacks at the doctor’s office. Josie was in the front of the cart, Margo was in the back, and Theo was walking (with strict instructions not to touch a single thing since he was sick). The girls started standing up in the cart and hitting each other because Margo wanted to get in the front of the cart and Josie wouldn’t let her. They literally were screaming and hitting each other and all I could think of was “I just need 5 minutes to get to the cash register and check out!” It wouldn’t have mattered to them if we left without popsicles because they didn’t even know I was getting them. Do you know what I did? I gave them lollipops. Yup. 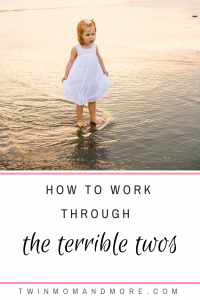 I knew that they were about to throw a fit because they were tired, hungry, and probably getting sick, so I took the easy way out. It bought me enough time to check out, get them into the car to get home, get lunch, and go to bed. Use your discretion with whether or not you want to distract them until you can get out of there, or if you should remove them from the situation immediately. I know how hard it can be because I’m going through it with you. While I can’t offer you a perfect solution, I can offer my real life experiences and trial and error.